There are seveal excellent Luaus in Kauai. A typical Luaus feature buffets that include staples such as lomi lomi salmon, teriyaki beef, kalua pork, haupia (coconut pudding) and the obligatory sampling of pasty, purple poi. At most luaus on Kauai, the kalua pig is still cooked in the underground imu pit where it cooks all day, as tradition dictates, and is removed with great fanfare and ceremony. Some luaus have more upscale menus. 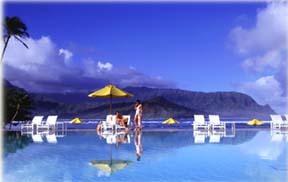 The following are seven Kauai luaus, in alphabetical order according to venue. Halau Na Punua O Kauai dance company also known as Rohotu Tahitian Dance Co has won many awards throughout Hawaii as well as in Tahiti. "Kauai's Best Luau," debuted in August 2004, consists of the expected buffet show includes lively Tahitian drumming, Hawaiian chanting, pahu drum dances and a Samoan fire dancer along with more traditional Polynesian dances. The luau is held outdoors at the Aloha each Tuesday. Seating starts at 5:15 p.m. and the show ends at about 8 p.m.
Tickets cost $65 for adults, $62 for seniors, $40 for guests ages 13 to 19, $30 for children ages 6 to 12 and free for kids under 5. Premier seating next to the stage costs $5 extra per person. "Hiva Pasefica -- Dances of the Pacific," the show traces early Polynesian explorers' journeys from Tahiti to Hawaii. Diners watch the pig unearthed from the imu, after which restaurant staff shred the meat in plain view. The meal consists of a buffet with traditional fare. Vegetarian meals are available with advance notice. There's also an open bar. The Courtyard Kauai's luau is held daily, except Mondays. Tickets are $65 fro adults, $59 for seniors, $42 for teens, $32 for children ages 3 to 12 and free for children under 3. Premier, cushioned seats near the stage cost $10 extra. With its beautiful, oceanfront setting, the Grand Hyatt's "Drums of the Paradise" luau is a cut above some other shows. It attracts big crowds, which means that getting the best seats may require getting in line up to one hour before the doors opens. The luau entertainment is imaginative, tracing a man's journey across Polynesia, which begins as a search for his one true love and evolves into an education about himself and dirrerent cultures. This show is one of the island's largest featuring 25 dances and musicians. Guests are welcomed with a shell lei greeting, and Hawaiian craft vendors sell their wares in a market adjacent to the luau. Dinner consists mostly of traditional luau fare but is prepared and presented with flair and panache. Drums of the Paradise is held on Sundays and Thursdays. In the summer, a Tuesday luau is offered, as well. Prices are $75 for adults, $65 for guests ages 13 to 21, $37.5 for children ages 6 to 12 and free for kids 5 and under. "Reflections of Paradise," takes place in and behind the carriage house of a 70-year-old sugarcane plantation estate. Before dinner, guests stroll the half-acre lawn behind the carriage house while sipping alcoholic or non alcoholic punch, watching demonstrations of Tahitian drumming, ipu (hollowed-out gourd) chanting, hat- and basket-weaving and poi ball spinning. The buffet is top-notch cuisine that includes local delights not usually found at other luaus, such as Hawaiian sweetbread, chicken long rice and kalua pork with cabbage. Seating about 250, this luau, held Tuesdays and Thursdays, has a more intimate feel that some. Tickets are $65 for adults, $61 for seniors and guests ages 13 to 18 and $35 for children ages 4 to 12. Kids age 3 and under are admitted free. 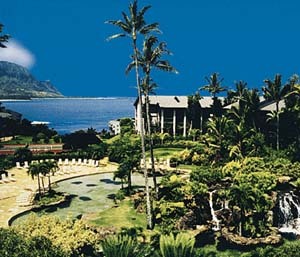 Featuring stunning sunsets over Hanalei Bay and the Bali Hai mountains, Princeville Resort's "Paina O Hanalei: luau offers Kauai's most sensational luau setting. Held outdoors under a roomy tent adjacent to the swimming pool and seating about 250, this is also one of the more intimate luaus. While enjoying the gourmet buffet, guests are treated to the contemporary Hawaiian music of the Papaa Bay Boys, a popular island band. After-dinner entertainment is headlined by Mi Nei Oliver, who has won more than 22 awards in Tahitian dance, and includes a review of all Polynesian dances. The luau is held Mondays and Thursdays. Tickets are $75 for adults, $70 for seniors and teens, $40 for children ages 5 to 12 and free for kids under 4. "Surf to Sunset" luau, debuted in June 2005 are treated to wonderful sunsets before the entertainment begins. Hosted by the loquacious Dickie Chang, a local TV personality, the show features hula by Kapu Kinimake-Alquiza and here dancers, as they enact how Pele, the Hawaiian volcano goddess, came down from her mountain. They also illustrate the evolution of hula, from its ancient origins to modifications later enacted by Christian missionaries. The luau buffet is mostly traditional and includes a delicious mango barbecue chicken, but the kalua pig is prepared in the kitchen rather that in a imu pit. "Surf to Sunset" is held Mondays and Fridays. Tickets for the buffet and show are priced at $68 for adults, $34 for children 6 to 12 and free for kids under 6. Golden Circle seating fronting the stage, with waiter service for dinner, is also available at $80 for adults and $40 for children. Strolling the grounds of this 30-acre, family-owned garden before its aptly named "Garden Luau" begins is a sublime experience. Guests view lagoons, trees and shrubs while peacocks and peahens strut about. Buffet fare and cocktail service are traditional. Entertainment follows dinner, in an amphitheater featuring a floating stage in the middle of a lagoon with a volcano backdrop. One of the grandest shows on the island, with 25 entertainers, the performance highlights not only the dances of Hawaii and Polynesia but those of local ethnic groups such as the Chinese, Japanese and Filipinos. As many as 15 members of the local Smith clan work each evening, doing everything from pulling the pig from the imu to performing. The "Garden Luau" is held Mondays, Wednesdays and Fridays, priced at $65 for adults, $30 for kids ages 7 to 13 and $19 for children ages 3 to 6. Show-only tickets are also available at $15 for adults and $7.50 for kids 3 to 12.